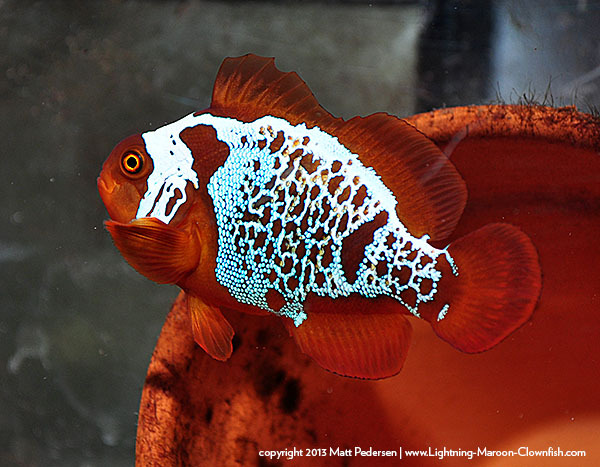 Two photos shot tonight in the fishroom – one is the pair on their latest spawn, and the other is my personal favorite holdback, the one I’m using to document pattern development Enjoy! 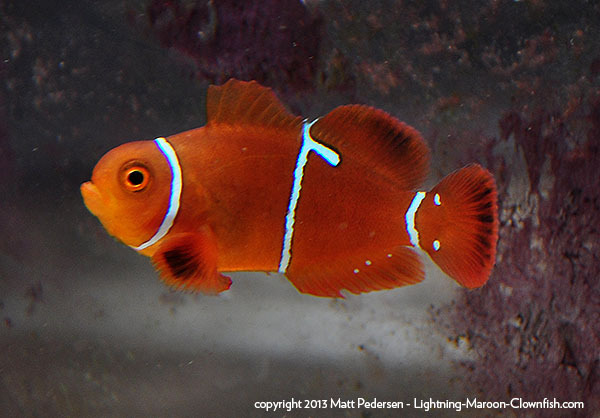 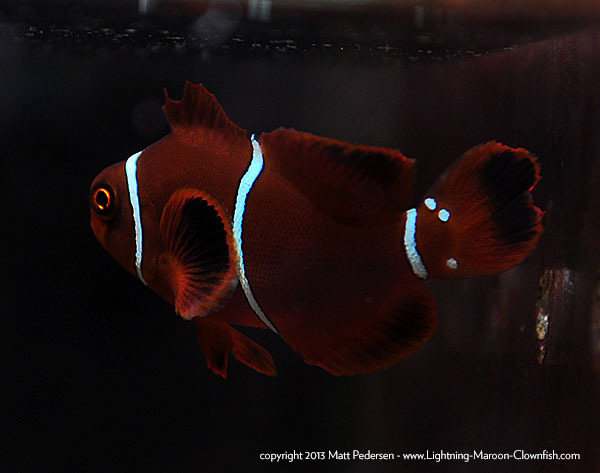 Lightning Maroon Clownfish and it’s White Stripe Mate, tending to their 8th spawn. 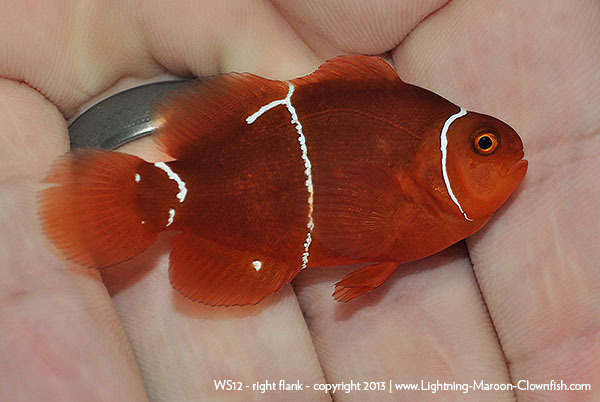 An update on the Lightnings! 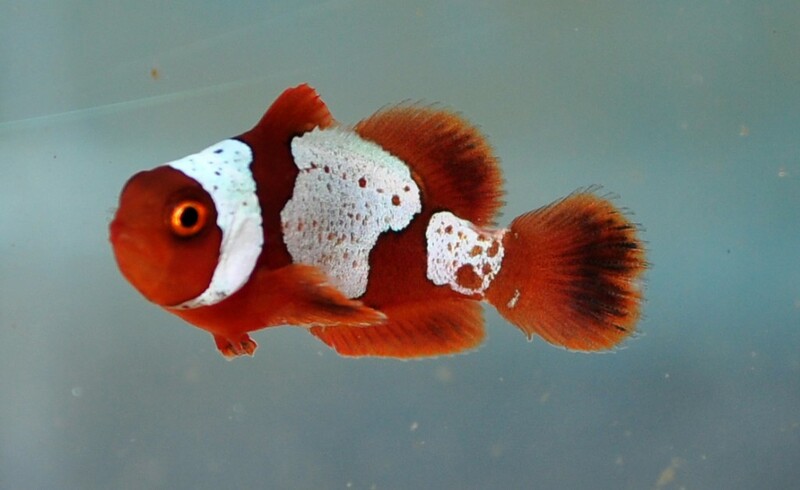 Yes, here it is, has been too long. 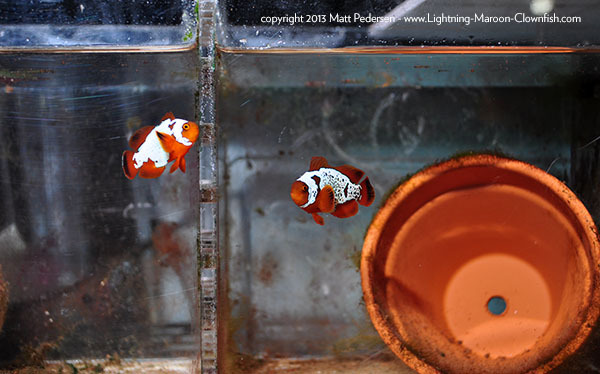 With each passing day I am evermore convinced that my hypothesis about the Lightning pattern development is correct. 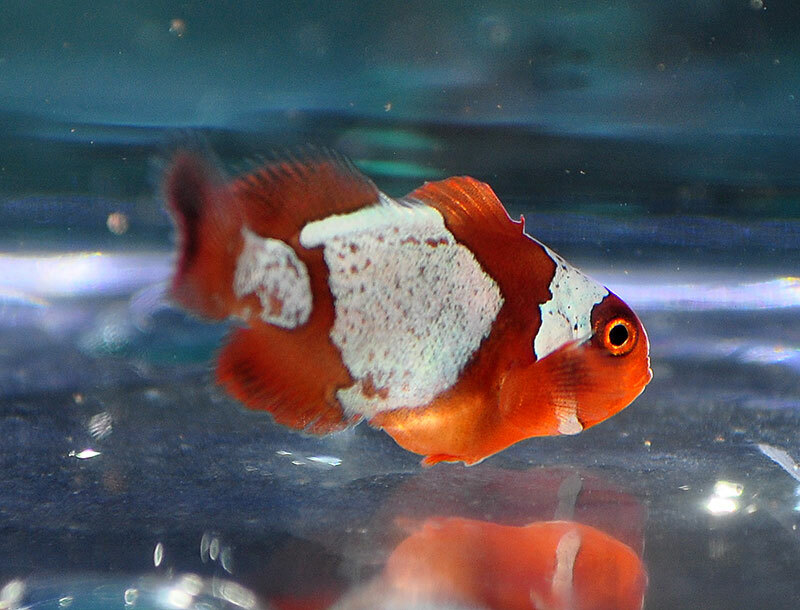 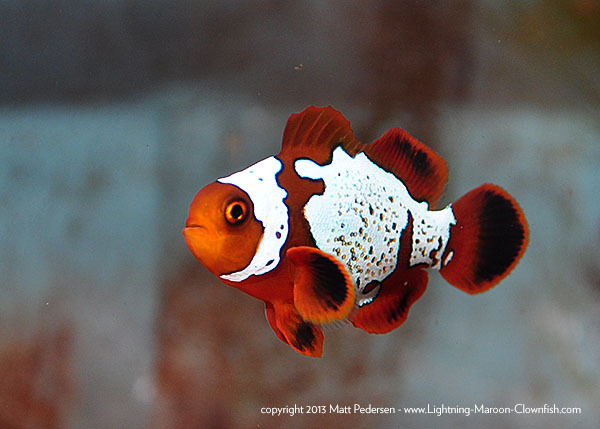 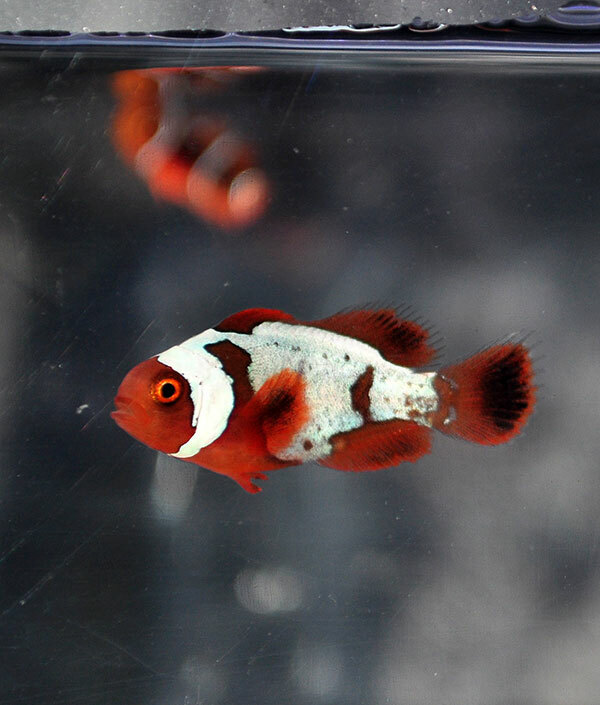 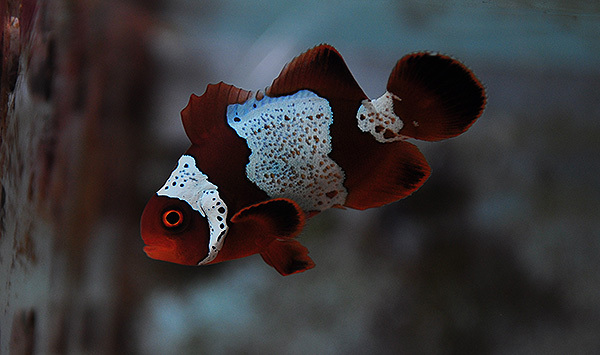 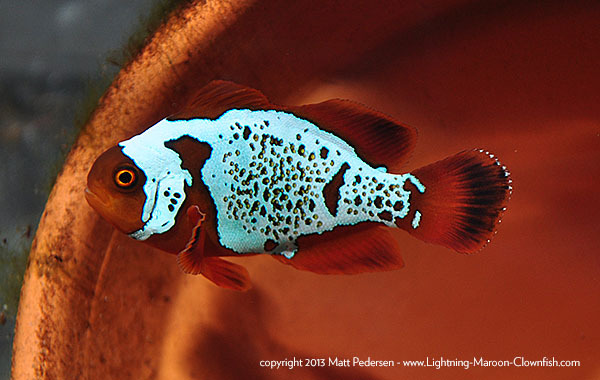 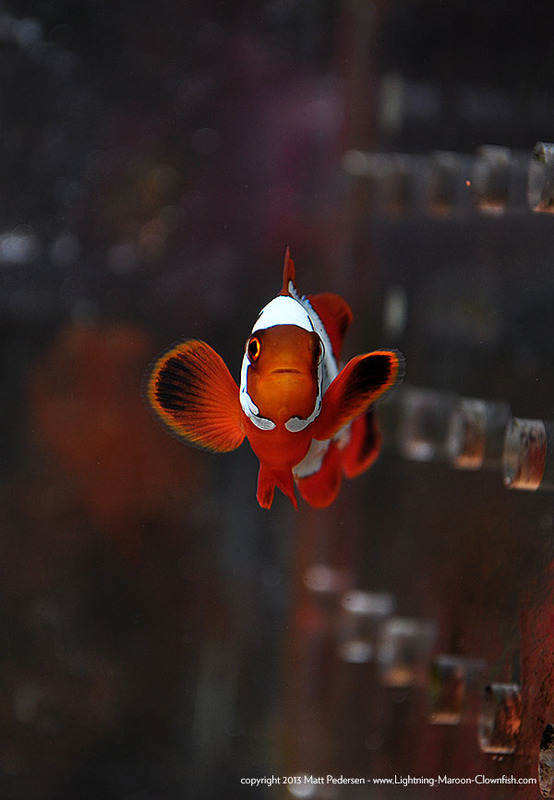 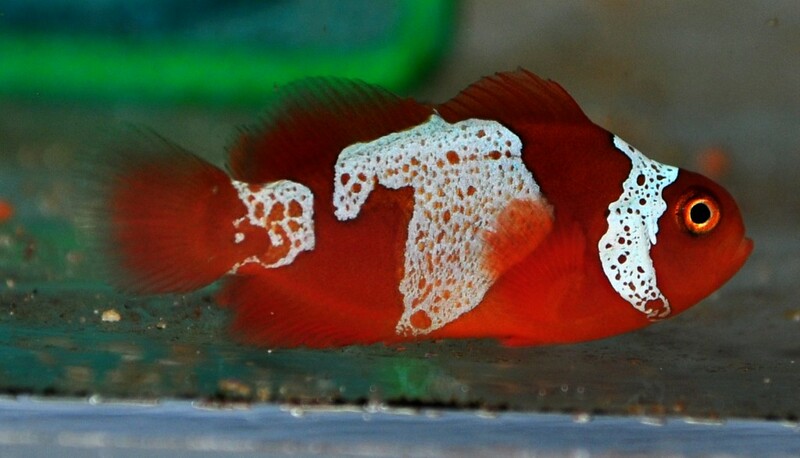 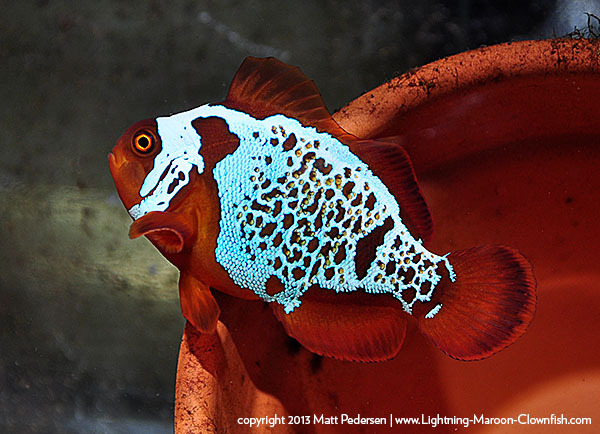 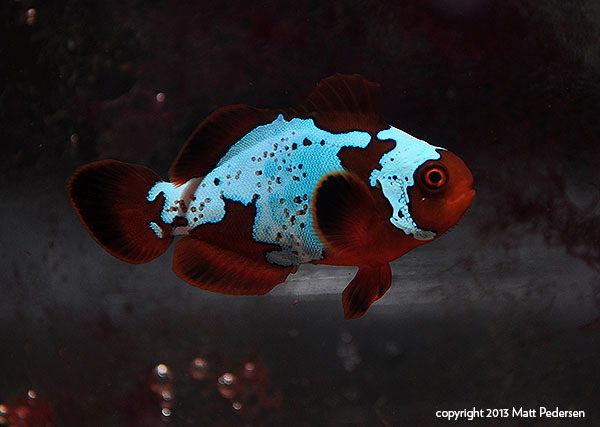 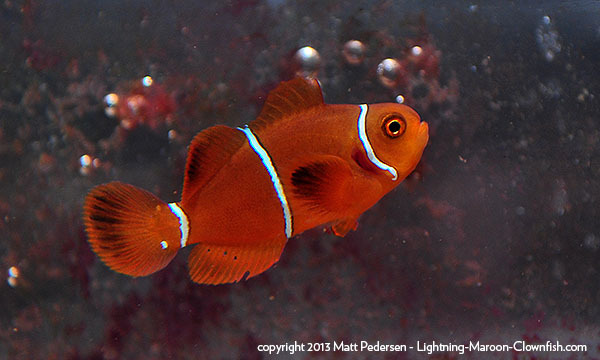 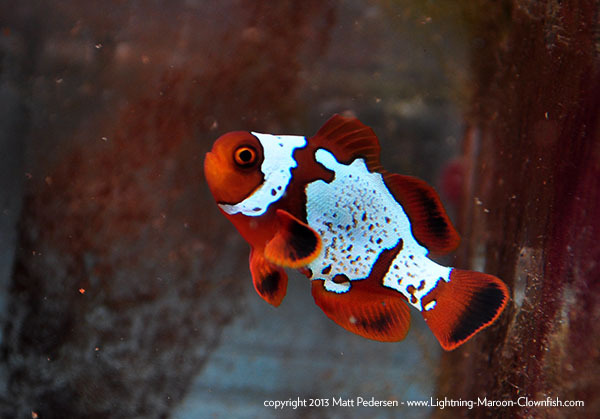 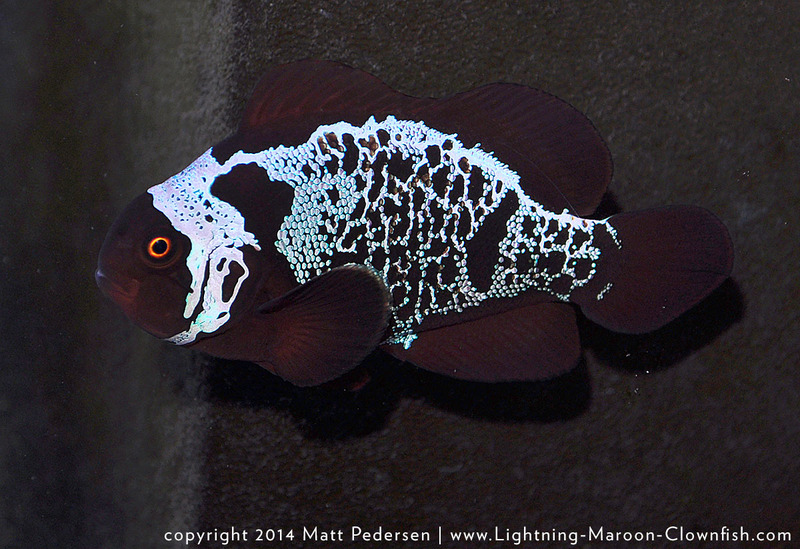 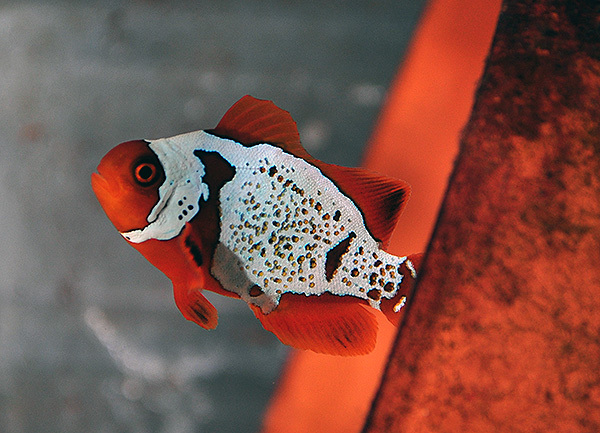 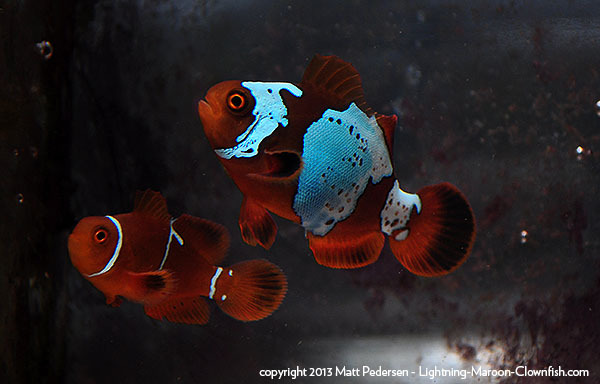 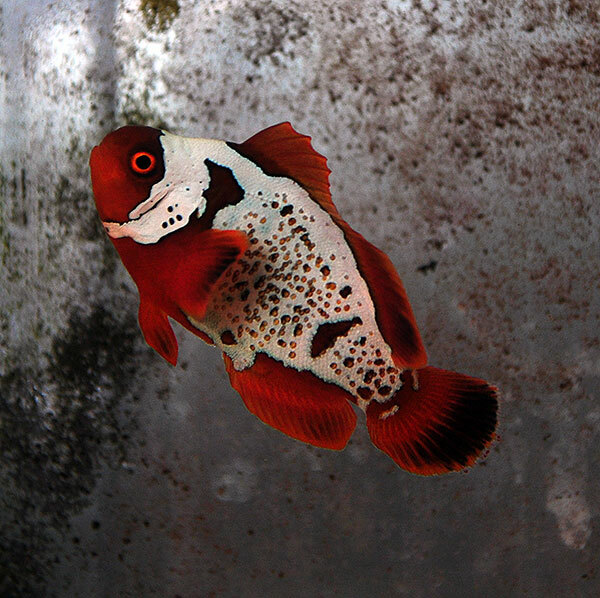 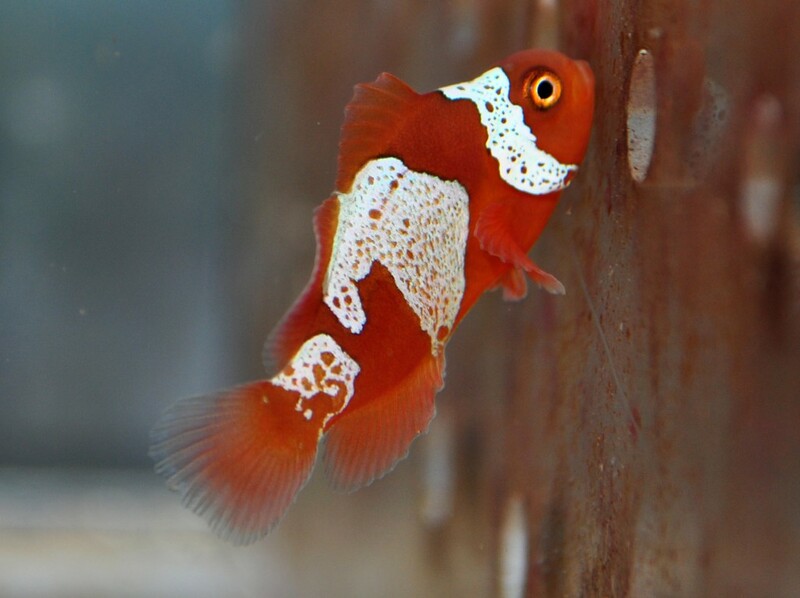 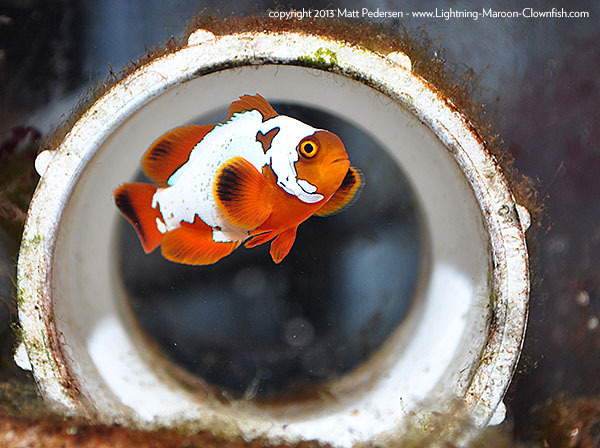 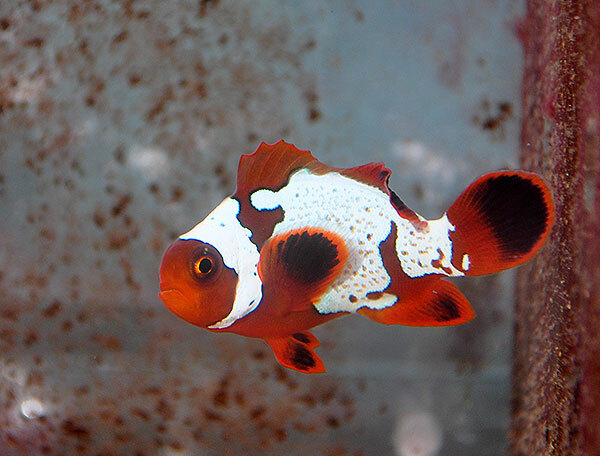 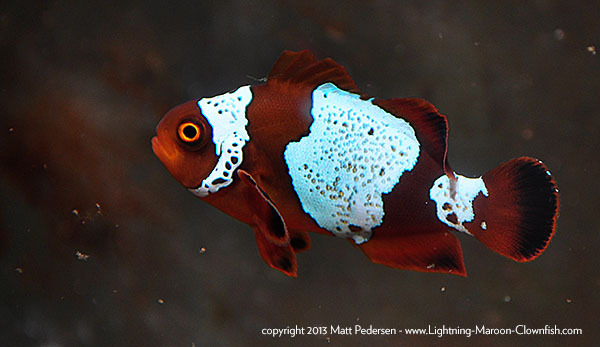 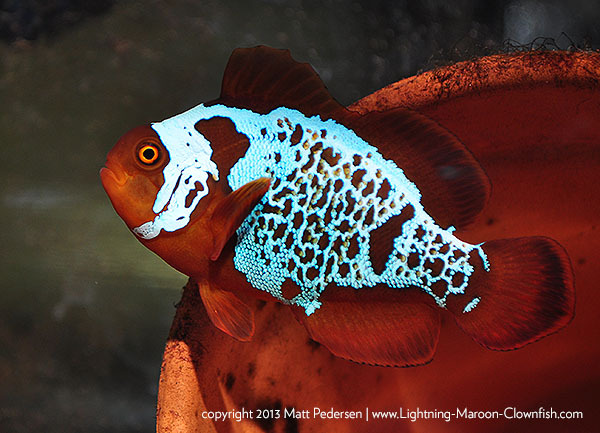 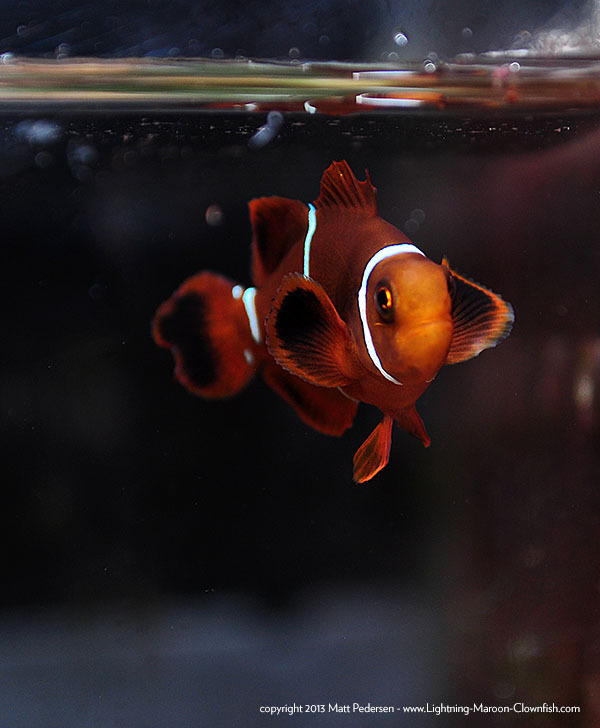 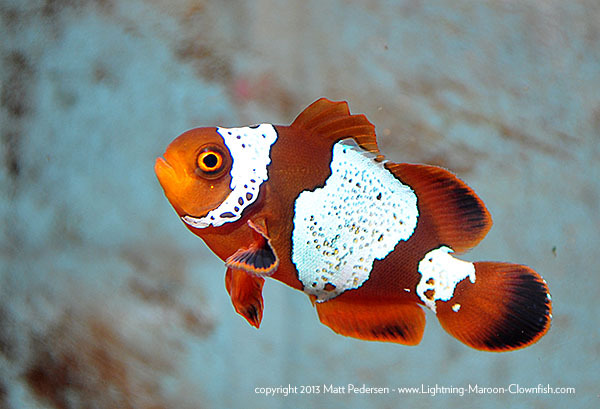 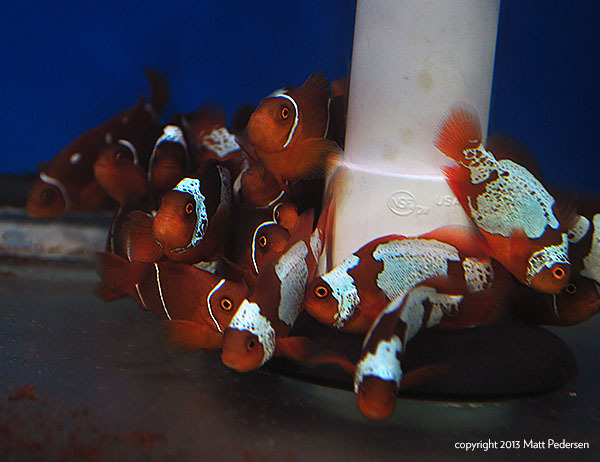 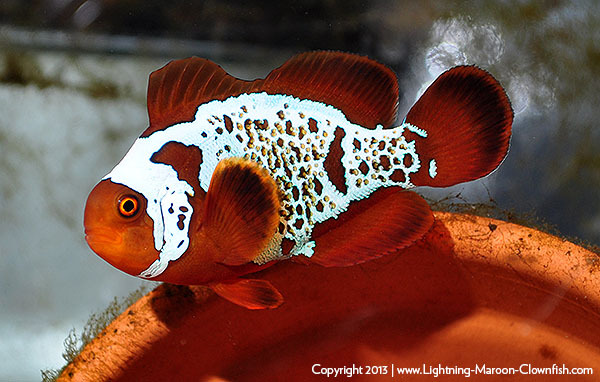 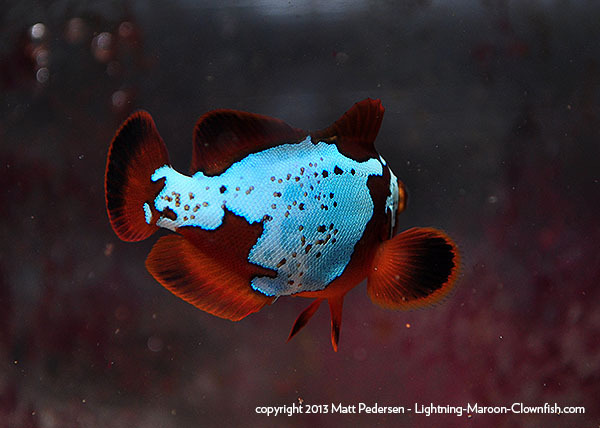 The “lightning maroon clownfish pattern development” photo series post has been updated as well. 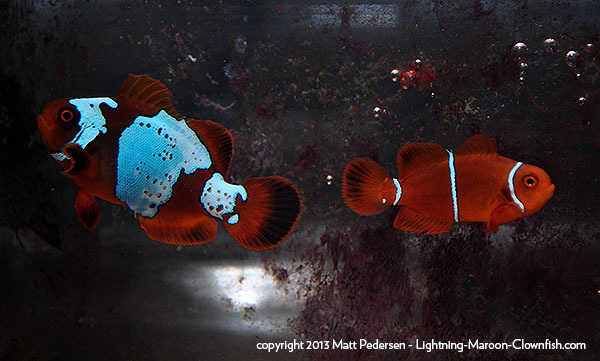 This is what the Lightnings are looking like now. 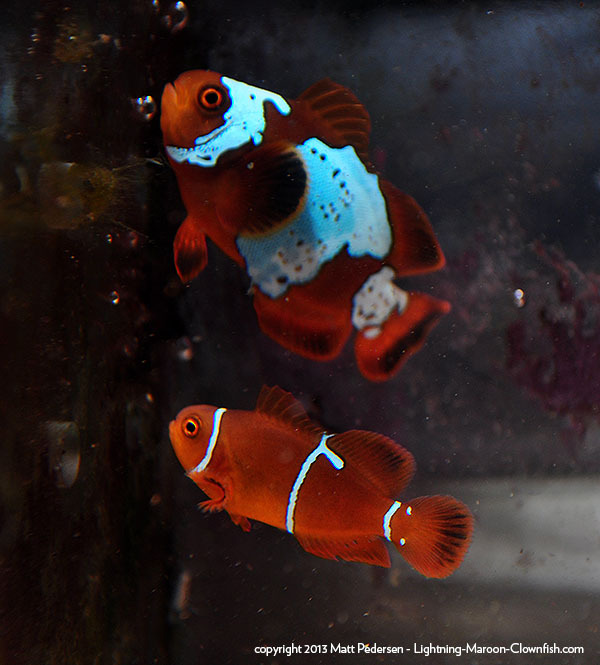 This is the pair I’m holding onto to make a “Lightning” X “Lightning” pairing Time to start feeding the one on the right twice as often as the one on the left so that 6 months from now, the one on the right is twice as big! 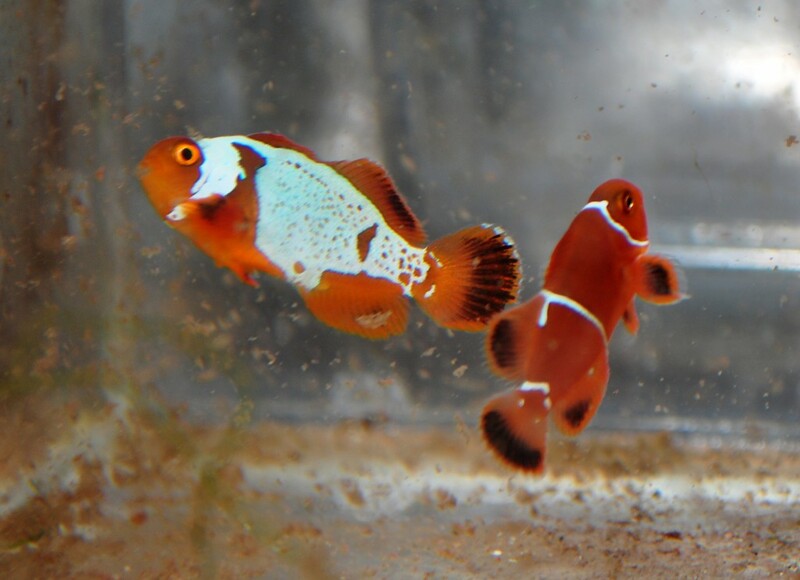 The left fish; future male. 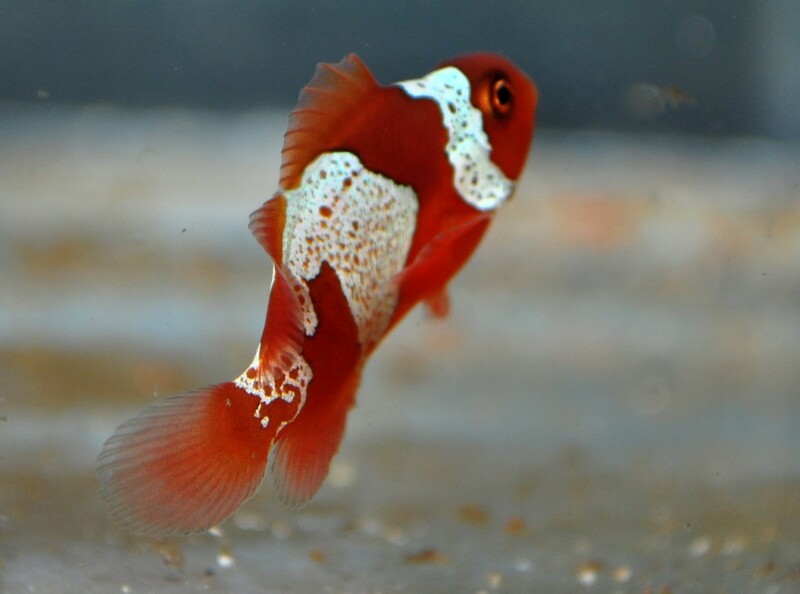 The right fish; future female. 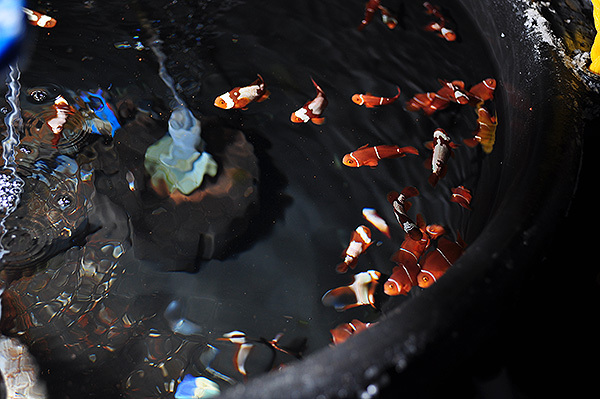 The most interesting thing I’ve noticed is that I’ve made no difference in care other than temperature and lighting; the large group in growout has been at warmer temps and has grown significantly larger and faster. 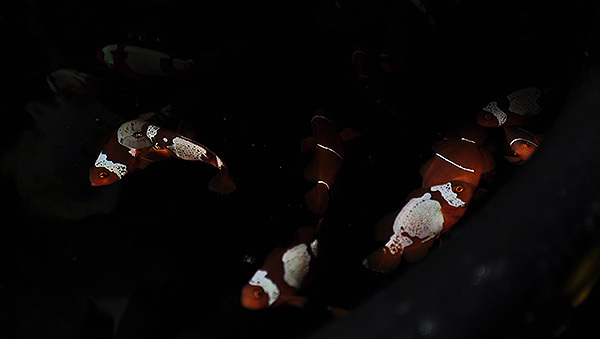 However, under only ambient lighting and in a group setting, they’ve not developed the intensity of color that these isolated specimens have. 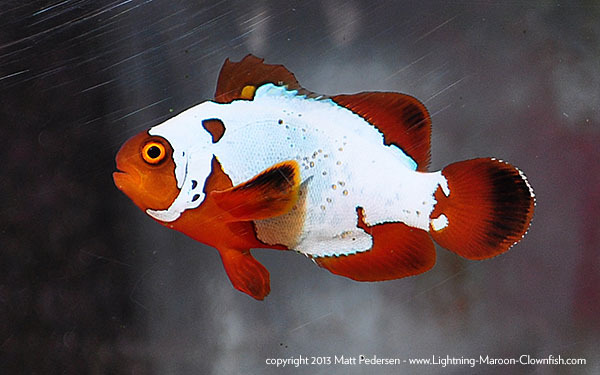 I’m bringing on the lights to get these fish ready for sale! 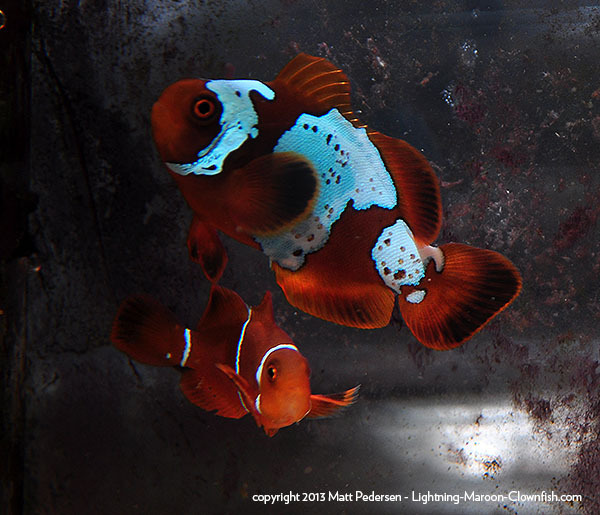 Last Wednesday, December 5th, I was surprised and saddened to find a few dead Lightning Maroons in the larviculture system. 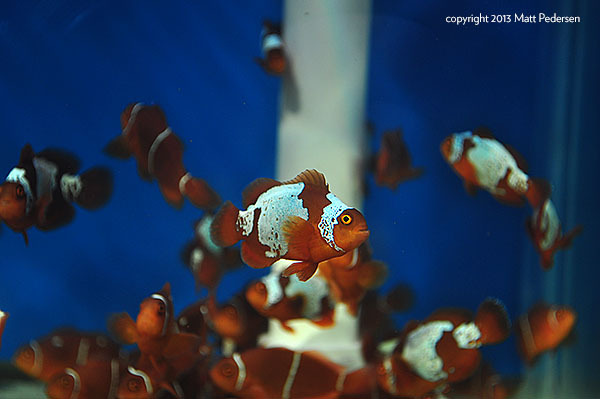 The mortalities were restricted specifically to the large aggregate group. 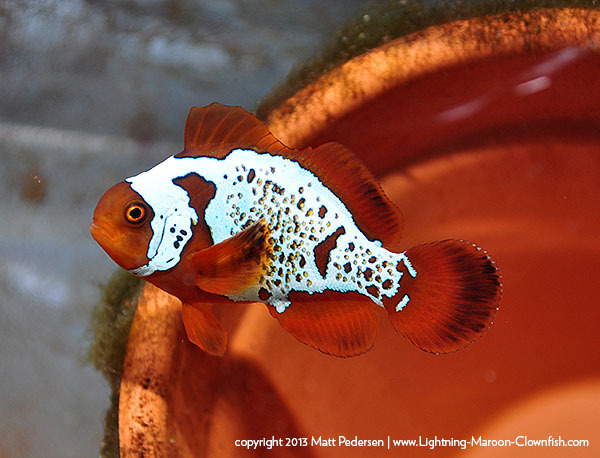 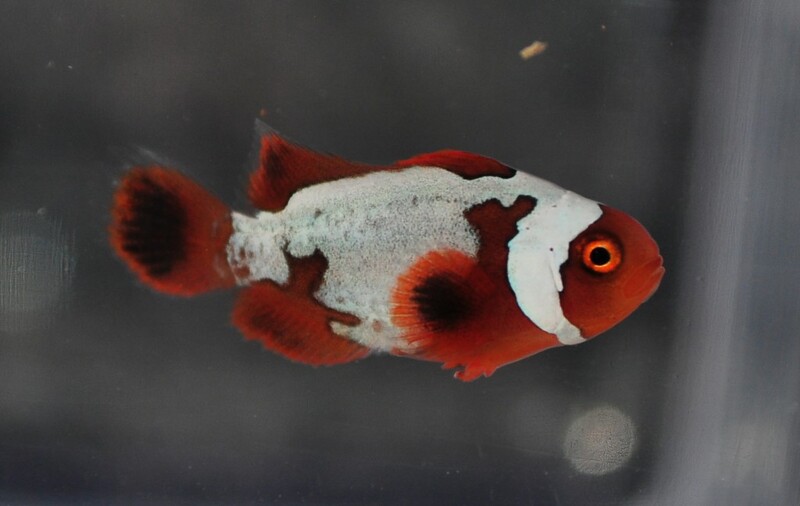 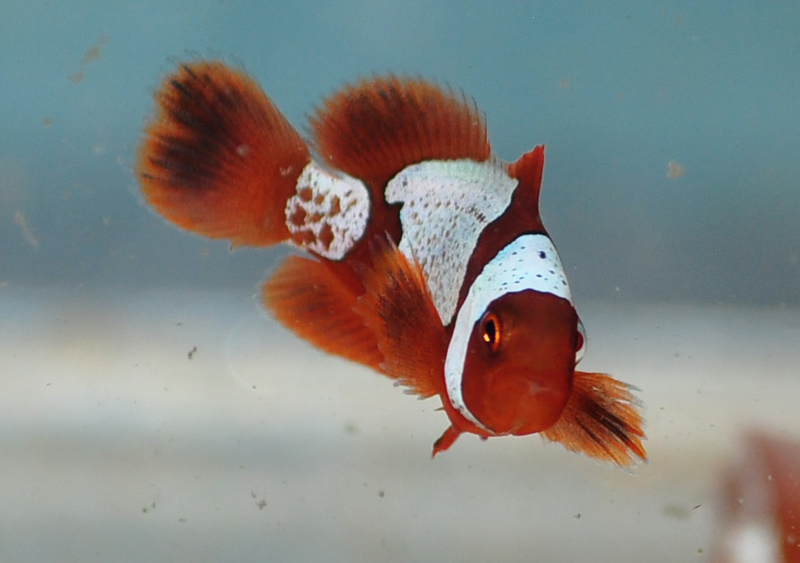 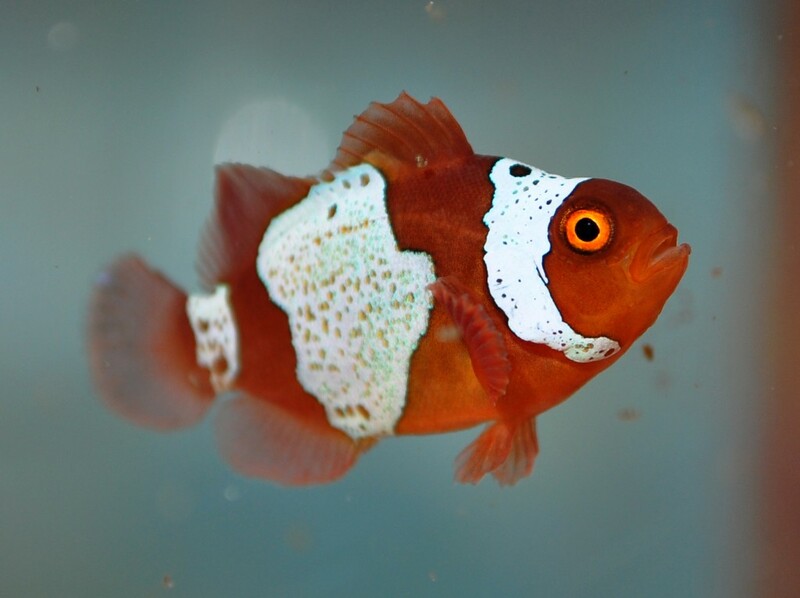 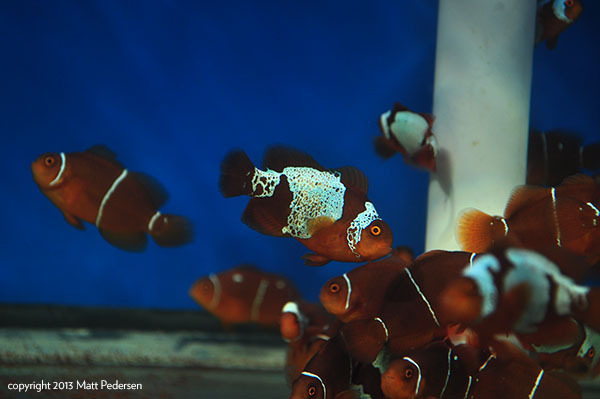 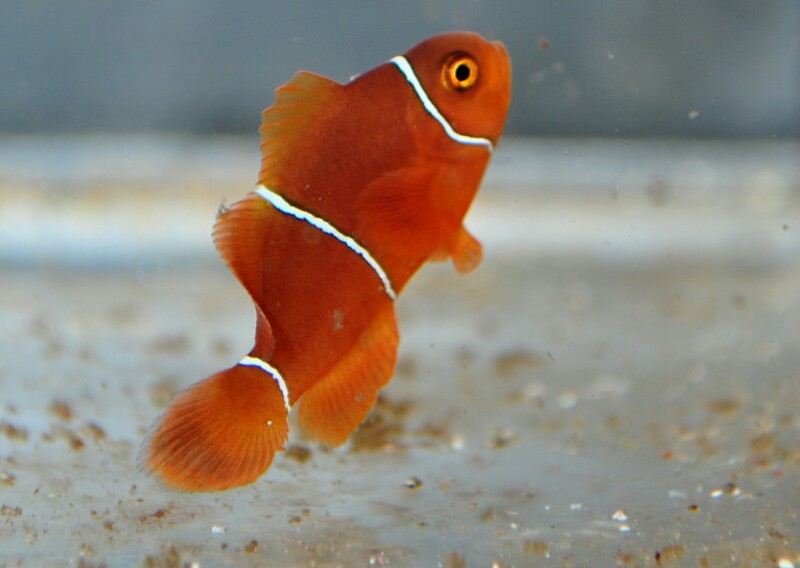 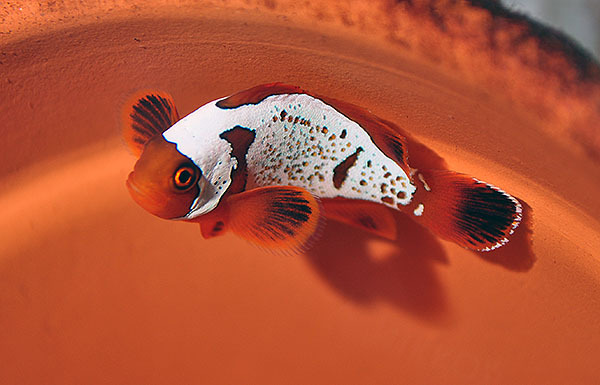 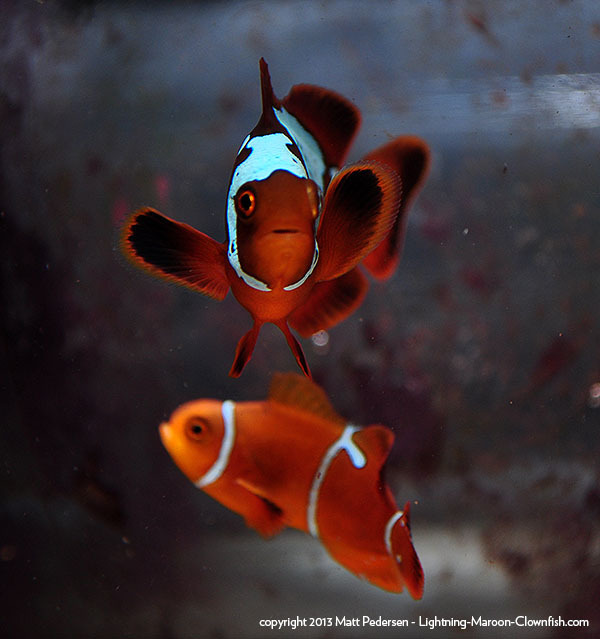 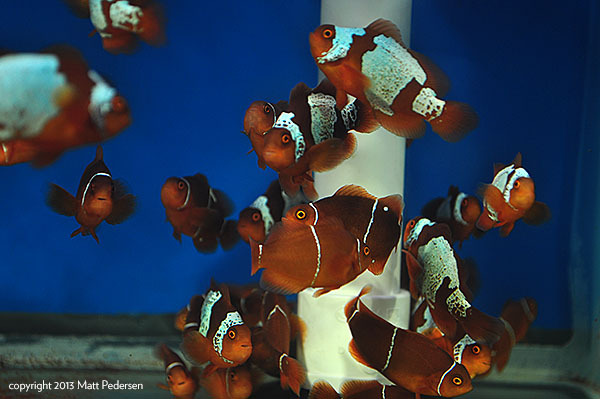 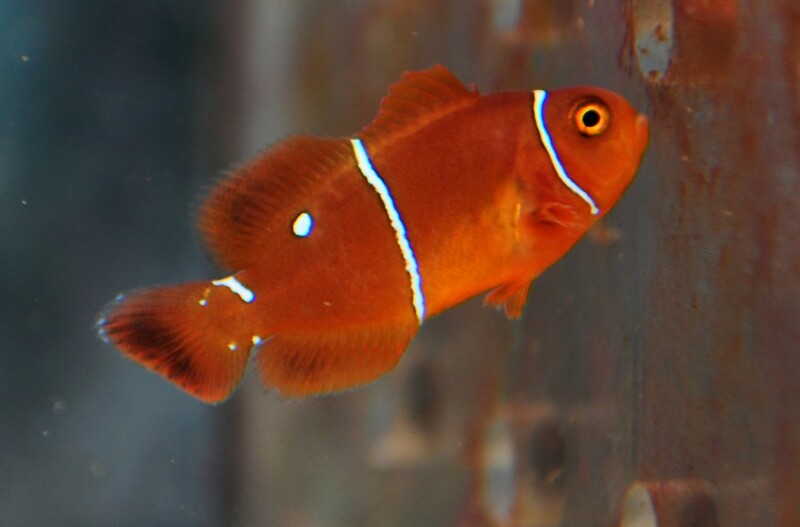 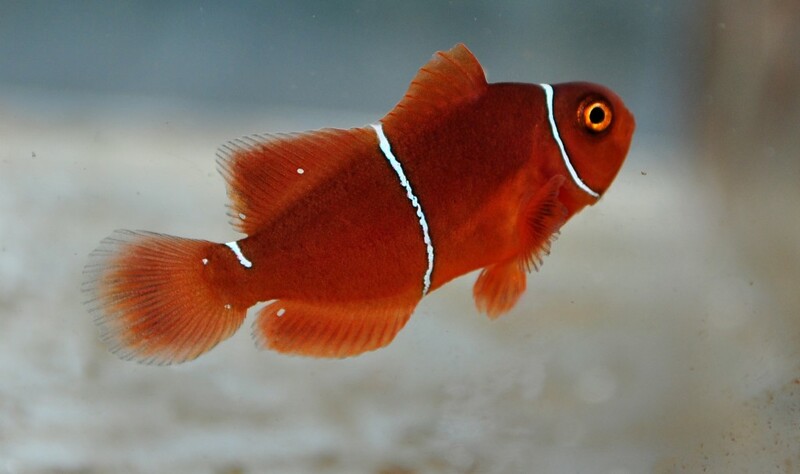 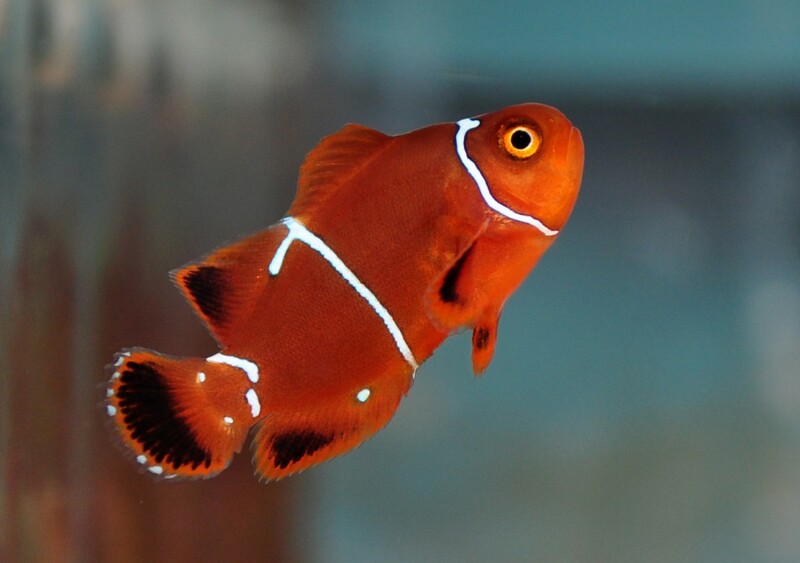 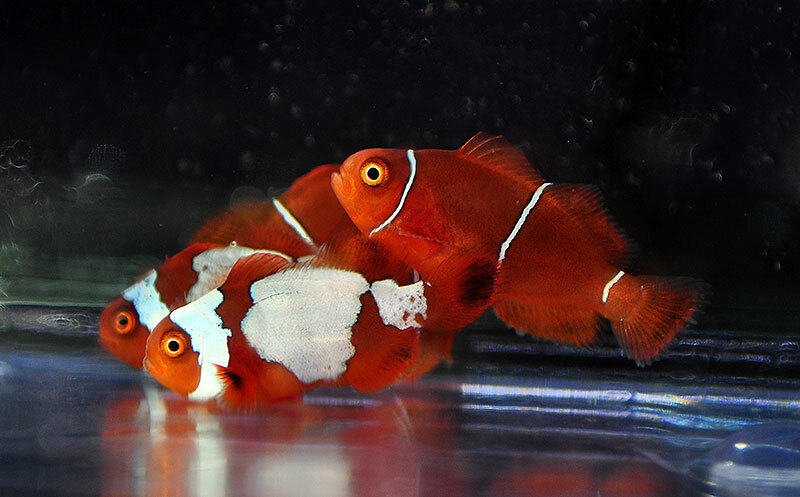 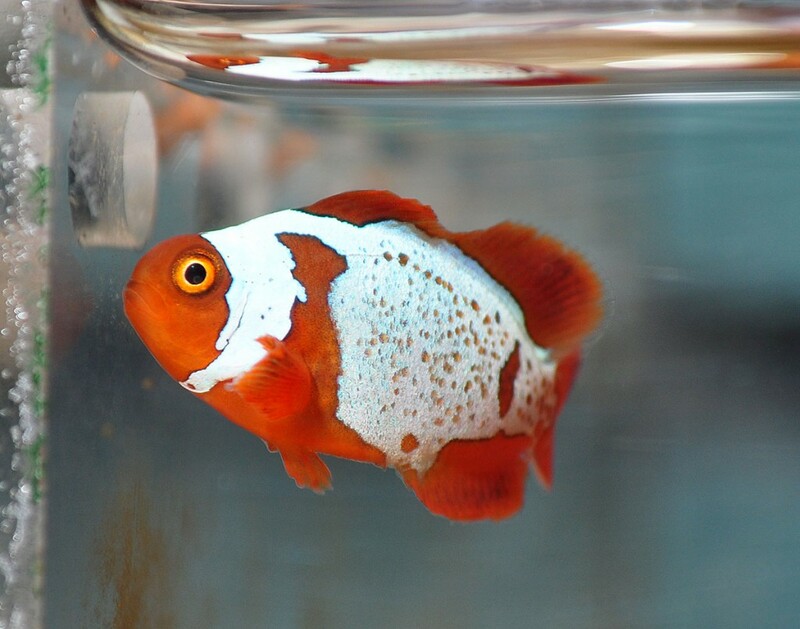 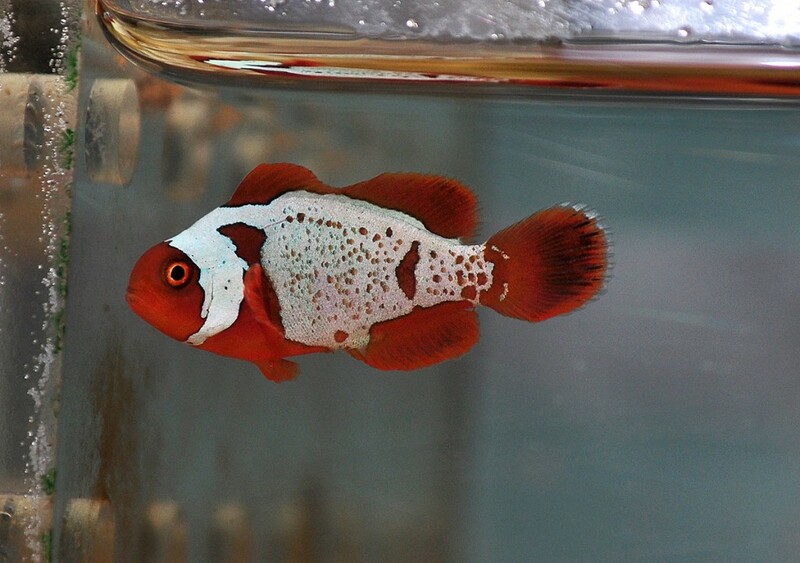 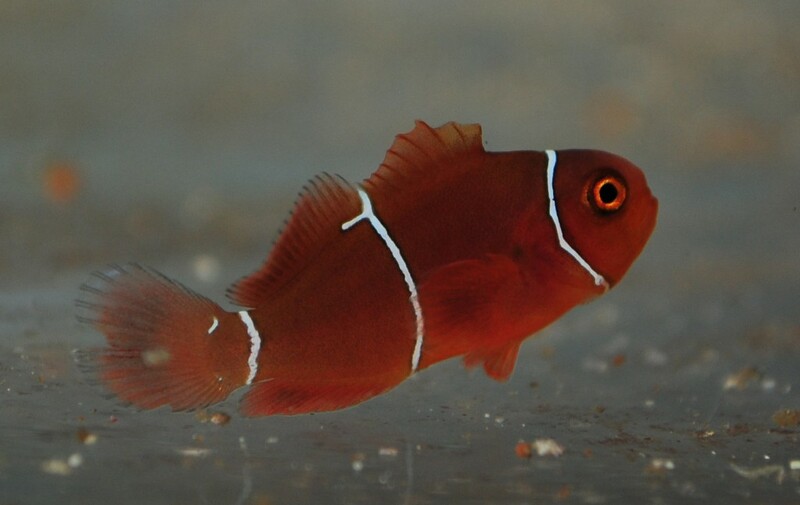 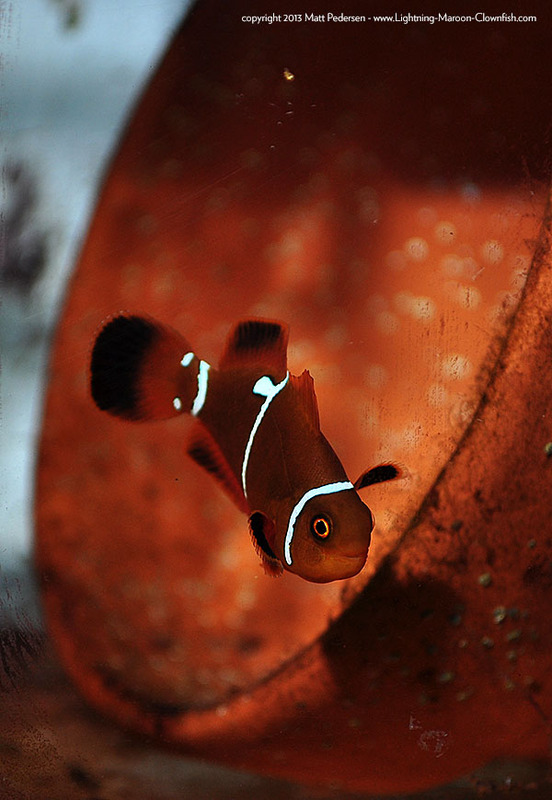 Many of you may be aware that Maroon clownfish are notoriously nasty to each other, so much so that some breeders have said that in white strip variants (which would include our Lightning Maroons) they can rear hundreds of fish and find only FIVE that are sellable. 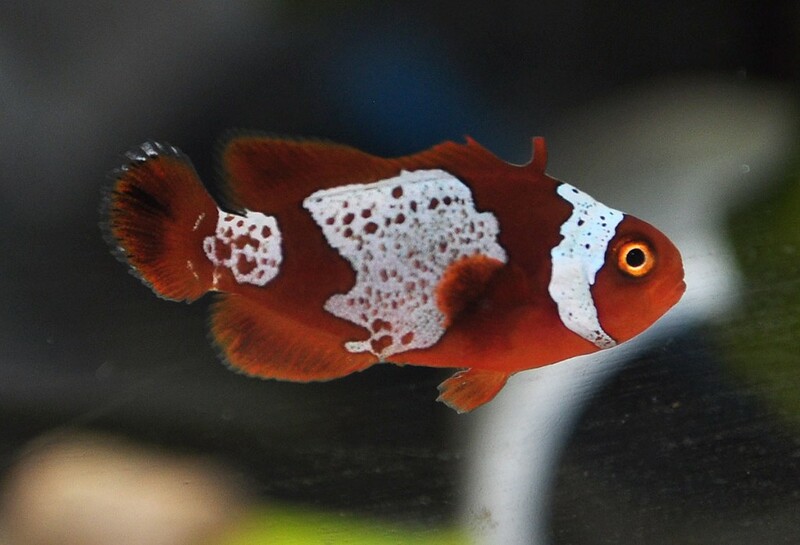 I had been planning for months now to segregate all the fish into individual containers, but each time I look at the fish, they seem happy, and the damage to their fins is less and less noticable. 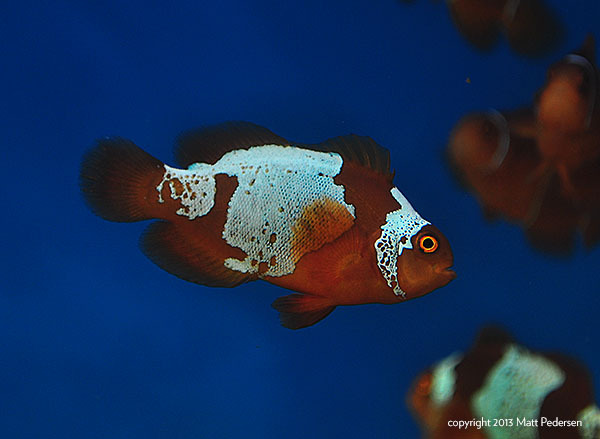 In other words, up until December 5th, the fish themselves had given me no reason to separate them! 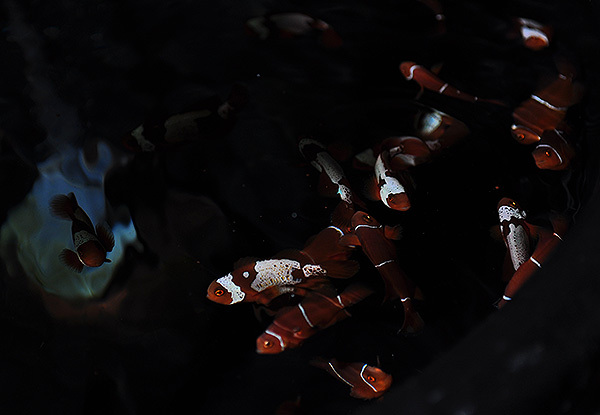 Well, the losses could have been from aggression, or they could have been from too many fish being in the same amount of space. 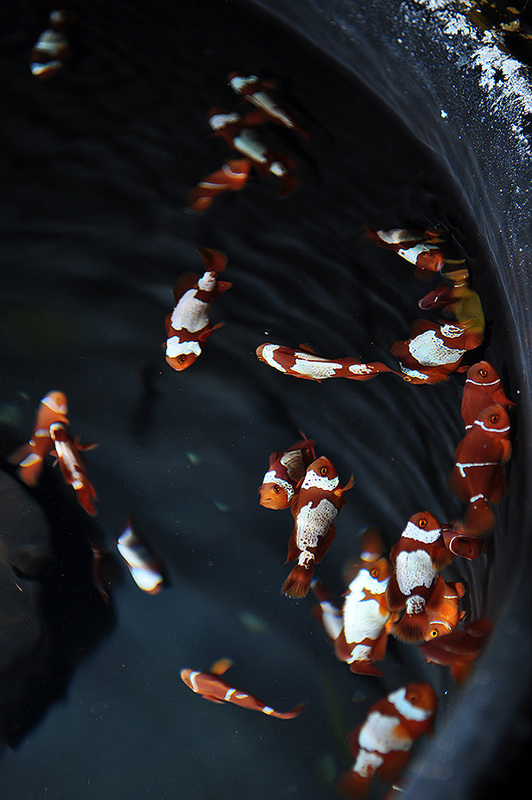 Perhaps the flow of water into their tank had been disrupted for a time. 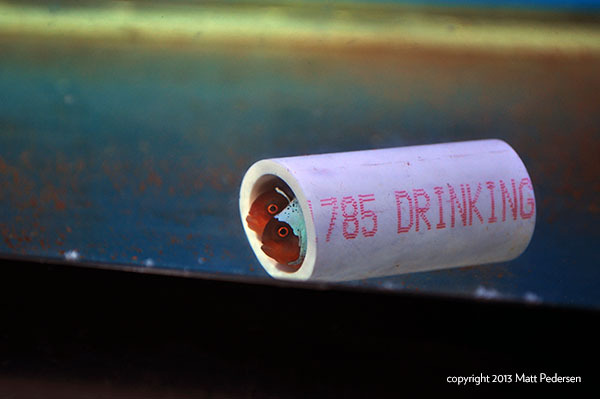 Ultimately, I’m simply not sure what caused the losses. 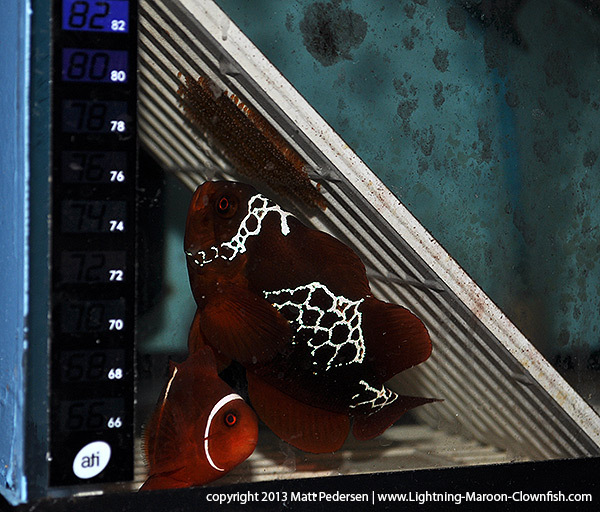 One of the most interesting things I’ve noticed about the Lightning Maroons growing out is that the ones kept together have grown FASTER than the fish I separated out into individual containers. 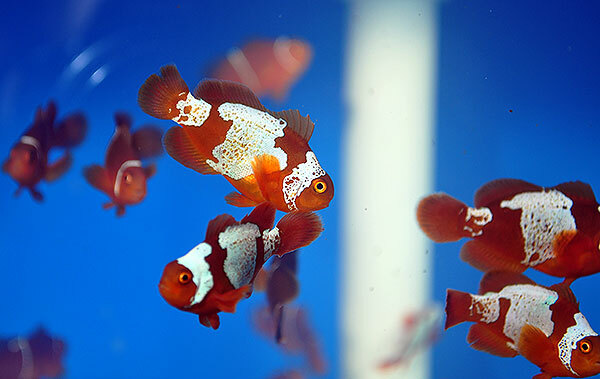 The ones kept together are also more bold and outgoing. 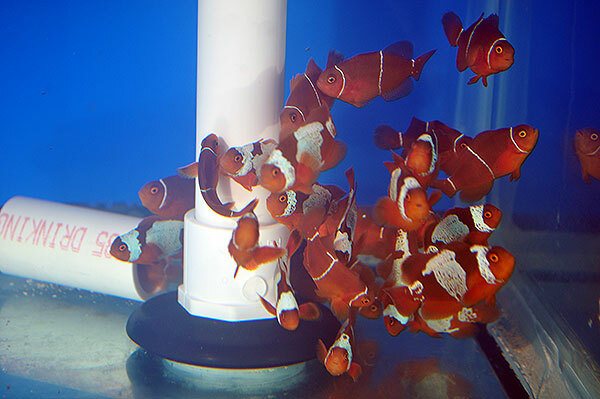 Since I have a massive 200 gallon+ growout system here, designed specifically to grow fish out, I opted to MOVE all the Lightning Maroon offspring together into a 33 gallon breeder on the system. 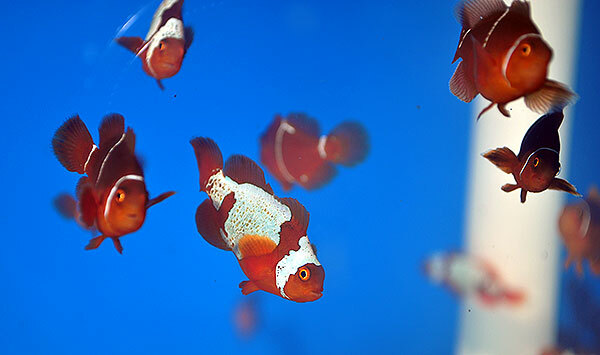 I took this opportunity to do a headcount – of course now I cannot remember, but I think within the group, I counted around 48 fish (keep in mind I’ve given away 2 so far, and I fond out I missed 3 in the bucket, plus I have 14 in the cube runs, and I lost at least 3 + I had one jump along the way). 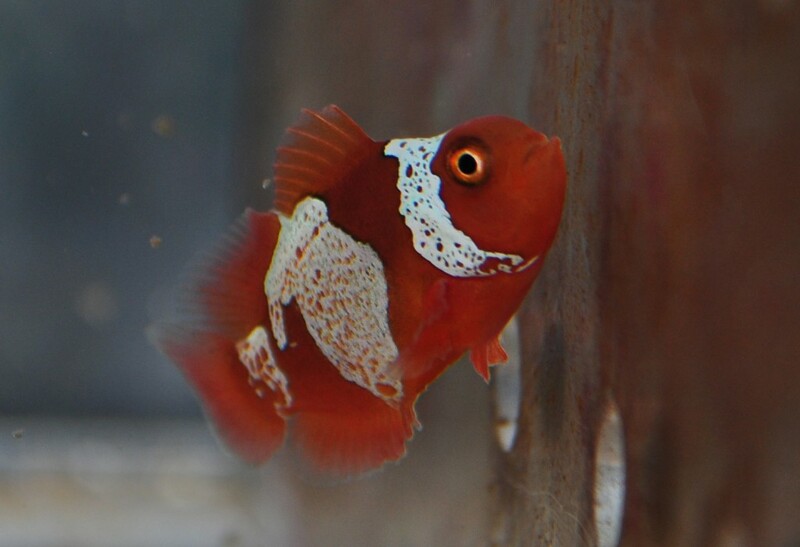 So my guestimate of 60-70 fish may have been very close. 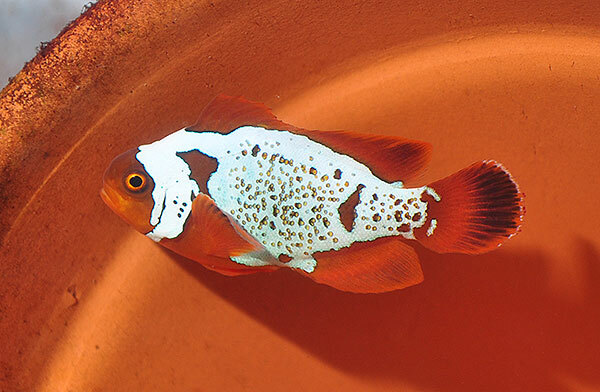 At this point, the fish are getting “big”. 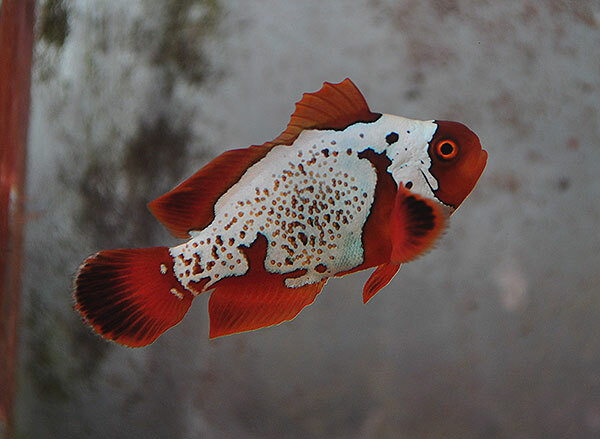 I had hoped to be selling some at this point, but we simply haven’t gotten there yet and holiday shipping traffic means that it is exceptionally risky to ship fish this time of year. 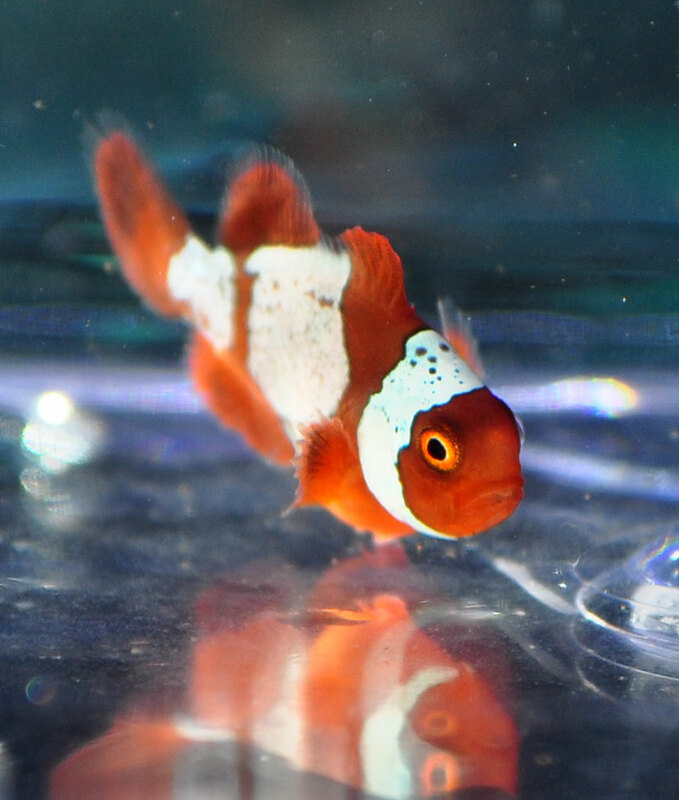 Better to wait. 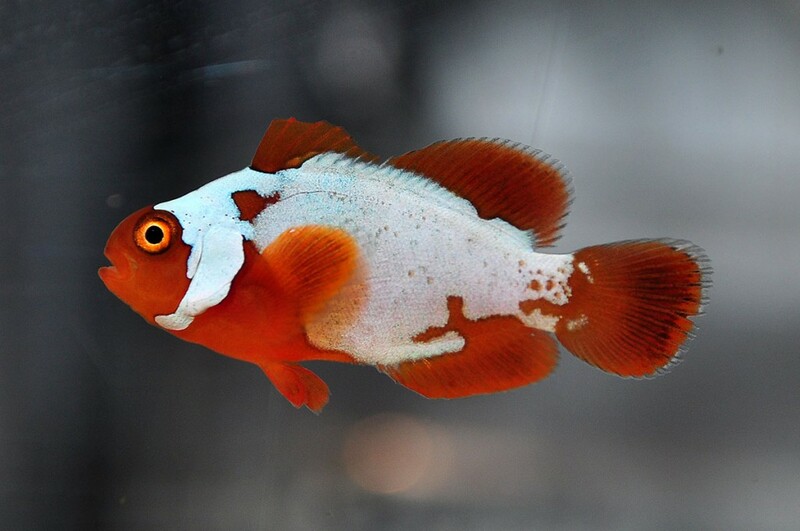 So at this point, we probably won’t be selling any of these until after the first of the year. 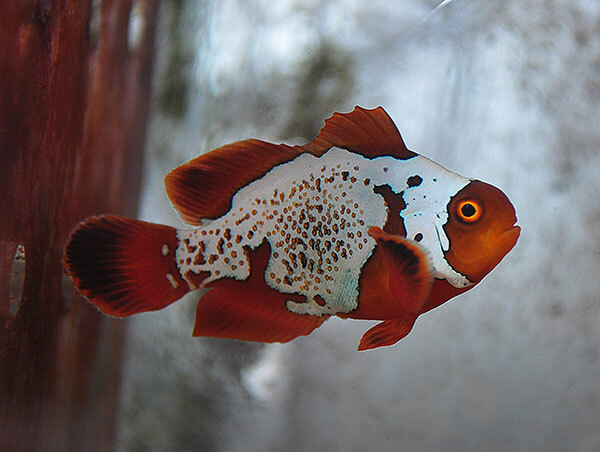 Honestly, I’d LOVE to send them out sooner, but it’s just not in the cards! 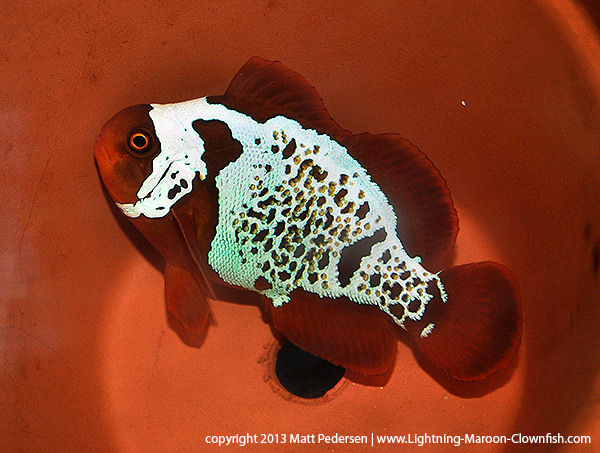 In the meantime, you can enjoy some new photos! 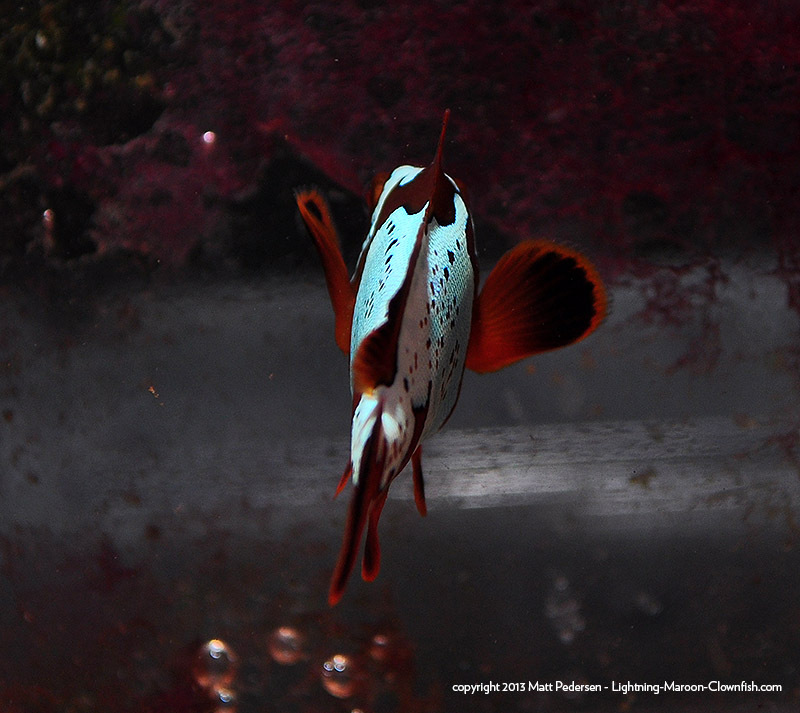 First, some shots of my favorite and a bonus shot of one of the “runty” ones. 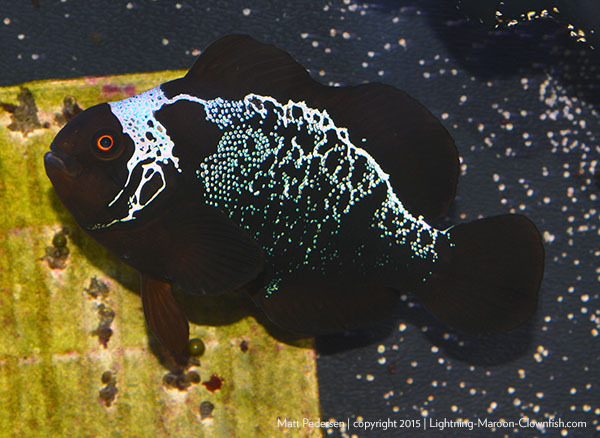 I’ve also gone back and updated the “month by month” progression post showing the pattern development on my favorite one. 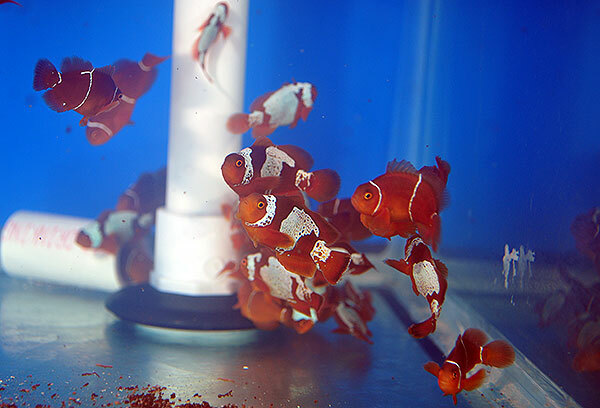 And finally, some shots of the group of juveniles in the growout system…it has a bit of a cloudy water issue, which is odd because it has a massive skimmer and a sock filter…I’m thinking it’s biopellet related and make take it offline to see if that remedies the situation. 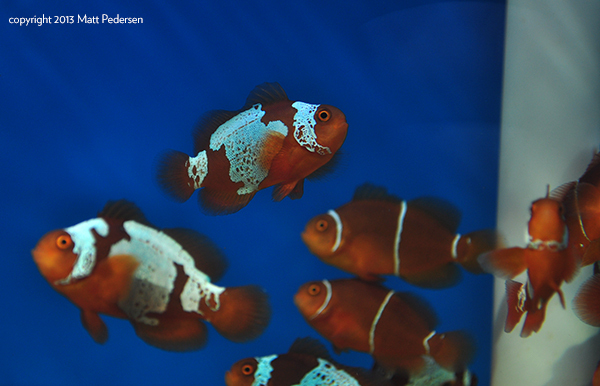 If not, water changes are in the forecast!